The battle for Nigeria's presidency is also being fought on the streets. On February 16, President Muhammadu Buhari and opposition leader Atiku Abubakar will face off in Nigeria's presidential election. The outcome of this highly contested vote is far from certain. Mannir Abba, a singer, sits on the steps of a beige house in the town of Daura, in the northern Nigerian state of Katsina. He has written a song for Atiku Abubakar and immediately starts singing praise for the 72-year-old presidential candidate and his party, the People's Democratic Party (PDP). "Atiku is the better choice. Everything you see in my home town of Daura was created during the PDP government," he adds. Other PDP party supporters clap around him. This is happening in the hometown of President Muhammadu Buhari. The 76-year-old is seeking re-election as a candidate for the ruling All Progressive Congress (APC). The people around musician Abba want to prevent Buhari from getting a second term. Aliyu Rabe Daura, who works for the state government, is one of those who have decorated their living room with posters of the incumbent. He even has framed photo of himself which he took with Buhari. "He is a good man. People respect him because of the word Gaskiya which means truth," explains Rabe Daura. He also appreciates Buhari's modesty. 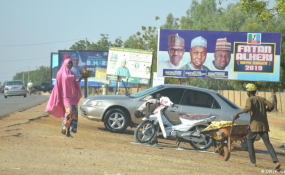 "The last time he was here in Daura, he walked from the mosque to his house." In 2014, Muhammadu Galadima, from the northeastern state of Adamawa also fled to Cameroon. Today, he lives in his former hometown Madagali. The area is still not really secured, he and other inhabitants told DW. "We would like the government to help us with water. But nothing [really] happens here." Buhari's campaign slogan is "Next Level". The 14-page program states that the foundation for a stable and prosperous Nigeria has been laid. In addition to the expansion of roads and electricity supply, jobs must now be created. That is exactly the core campaign message of Buhari's main challenger, Atiku Abubakar. With his "Atiku's Plan," he does not seek to to make Nigeria great again, but rather functional. Segun Sowunmi, Atiku's election campaign manager, considers his boss to be the ideal candidate when it comes to economic issues: "He has great experience in creating jobs through his companies. He has directly created 50,000 jobs and another 300,000 indirectly. We need jobs fast." Atiku's wealth is made up of companies that offer logistics, oil and gas services. He is also the founder of the American University of Nigeria in Yola. There are no reliable figures on his assets, but there are allegations of corruption and money laundering. According to a report by the US Senate, with the help of his fourth wife, Fatima Abubakar, between 2000 and 2008, he brought a total of $40 million (€35 million) to the US. During that period, Atiku worked for government authorities such as customs before entering politics in the 1990s. The highlight of his career was his eight-year term as vice president under Olusegun Obasanjofrom 1999 to 2007. He then changed parties several times and was a member of the APC from 2014 to 2017. After returning to the PDP, he ran a massive election campaign in the party's internal primary elections, which he won in October 2018. Atiku's campaign manager Sowunmi says Atiku only wants one term. "He'll respect that and fill 40 percent of the posts with young people," Sowunmi told DW. In Kojoli, sparks are flying as Clifford Abalane works with his Flex machine. More than 20 years ago, the 46-year-old settled in Atiku's home village in Adamawa. Abalane is reluctant to sing praises for Atiku. Nigeria's next president must above all fight poverty and "do something for the young people." A few young people are standing around him as he observes them. In addition to providing better opportunities for the majority of the Nigerian population, the craftsman is faced with a far more fundamental question: The electoral process. "We always pray that they are free and fair," Abalane says. Ezekwesili's Withdrawal - When Will Country Have a Woman President?